In addition, there are discussions of the sunset transfer curves of ducts; the relations of ducts to the dip diagram, and to the refractive invariant; and a more technical introduction to ducting in sunsets. So there are references to ducts all through these Web pages. Although the optical phenomena of ducts (notably, superior mirages and Fata Morganas) have been known for thousands of years, the term duct wasn't introduced until the 1940s, when radar operators in World War II began observing returns from objects far beyond the normal horizon. (This is called “anomalous propagation” by the radar people; in meteorological optics, it's the well-known phenomenon of looming.) The textbook example is the observation of the coast of Arabia by a 200-MHz radar in Bombay, India, 1700 miles away. In a nonhomogeneous atmosphere whose index of refraction decreases with height, rays of sufficiently small initial elevation angle are refracted downward with a curvature proportional to the rate of decrease of the index of refraction with height. If the radius of curvature is less than the radius of the earth, such rays reach a maximum height and are confined, or trapped, between this height and the earth's surface. This process is referred to as trapping, and the region of the atmosphere within which it occurs is called a duct, because of the analogy with wave-guide propagation. However, the basic phenomena of ducting were mentioned by Biot (1810 and 1836) and Radau (1882), and discussed in detail by Kummer (1860) and Wegener (1912 and 1918), in the context of atmospheric refraction and mirages — all, of course, without using the term “duct”. More recently, the word “duct” has been adopted in the optical literature as well [cf. the Meinels' (1984) book review]. Because optical refraction depends almost entirely on the temperature profile of the air, optical ducts are only produced when there's a steep thermal inversion in which the lapse rate is more negative than a critical value (near −0.11°/m, for typical conditions). Elsewhere on these pages, I've used a rather mild inversion of 2° between 50 and 60 m height, whose lapse rate (−0.20°/m) is nearly twice the critical value. Here, I'll use an even steeper inversion of 5° in the same interval of height, to make the ray diagrams clearer. The diagram at the left shows this example. The heavy curved line represents the surface of the Earth. 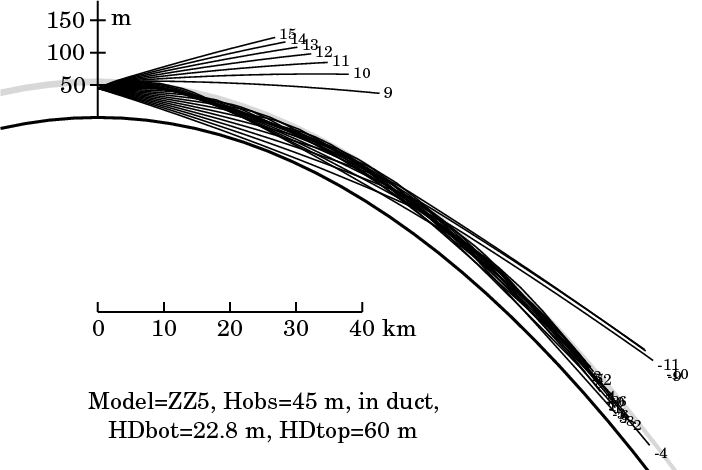 Just the lowest 100 m of the atmosphere are shown (see the scale at the upper left of the diagram), with a vertical exaggeration of about 100× (see the horizontal scale of kilometers). The shaded band above the Earth's surface represents the thermal inversion of 5° between 50 and 60 m height. Three rays are traced in this model atmosphere, from the position of an observer placed 45 m above the ground, on the height scale at the left. The right end of each ray is marked with the ray's angular altitude at the observer in minutes of arc: 0 for the ray at the observer's astronomical horizon, and rays 10′ above and below it. Notice that the rays at 10′ and −10′ are refracted inside the shaded inversion layer, but pass completely through it. However, the horizon ray is quickly bent back down when it enters the inversion, so that it returns to its original height (45 m) after about 24 km. Then the pattern repeats: the ray again enters the inversion and is bent back down near 36 km; it again returns to the original height near 48 km; and so on. This ray is trapped, or ducted. Clearly, even rays with a considerable slope — though somewhat less than 10′ — can also be bent back into the region below the inversion layer, and trapped there. The diagram at the right shows rays at 3′ intervals in altitude, for the same observer and model atmosphere as before. While the rays at +12′ and ±9′ pass through the inversion, those with slopes of 3′ and 6′ at the observer are trapped, or ducted. You can see that the rays 6′ from the observer's horizon (which peak near 8 and 35 km from the observer) penetrate farther into the inversion — i.e., closer to its upper surface — than those only 3′ from it. (e.g., the −3′ ray, whose apex is near 23 km). Also, notice how the ducted rays all come together about 44 km from the observer. The duct acts like a lens, focusing these rays into a crude image at this distance. This focusing effect produces the vertical exaggeration of images in superior mirages. In discussing the trapped horizon ray for the 45-m observer above, we noticed that it barely penetrated into the lower edge of the inversion layer. So this ray oscillates between heights of 45 and about 52 meters. All the other trapped rays in the second diagram pass below the observer's height, but don't reach the ground. So the bottom of the duct is somewhere between the observer and the ground. Just how low can a trapped ray go? 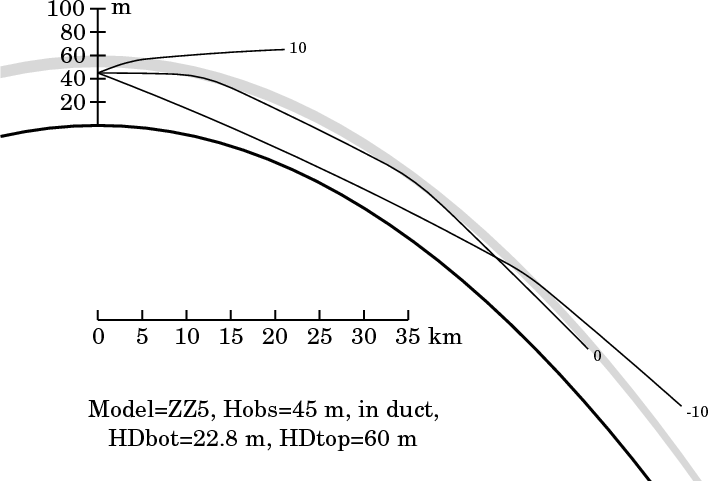 This question is answered in the labels on these diagrams: the top of the duct is the top of the inversion, at 60 m; but the bottom of the duct is far below the 50-m base of the inversion — it's at 22.8 m for this model atmosphere. This value can be calculated from the atmospheric model: it's the height at which the product nR (where n is the index of refraction of air, and R is distance from the center of curvature of the atmosphere) has the same value as at the top of the inversion. The product nR is the refractive invariant for horizontal rays at different heights; a plot of these values against height gives the dip diagram. The ducted rays gradually get out of step with one another, and fill up the duct. You can see this beginning to happen in the right half of the present diagram. 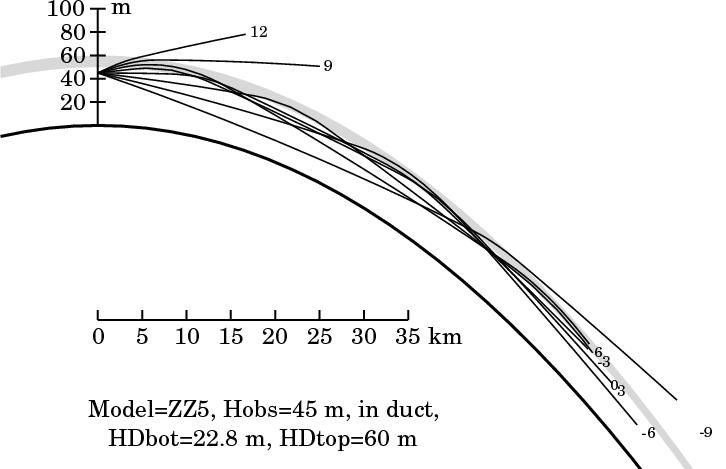 (Compare the 22.8-m height of the bottom of the duct with the height of the lowest rays in this region.) The lowest level reached by a ducted ray is the bottom of the duct. Finally, notice the big gap above the inversion between the two groups of rays that pass up through the duct. This is a region that's invisible from the observer's position. If a radar transmitter were where our observer is, it couldn't illuminate targets in this gap; so radar operators call this region a “shadow zone”. Optically, it corresponds to the zone of sky blocked by Wegener's blank strip. It's important to distinguish between the base of an inversion and the base of the duct it produces. While the top of the duct coincides with the top of the inversion, the bottom of the duct is always below the bottom of the inversion. That's because a ray that's horizontal just below the top of the duct has a considerable slope at the bottom of the inversion, as can be seen from the dip diagram. Also, notice that an optical duct always requires an inversion to produce it, because the optical refractivity of air depends on its temperature. But the reverse is not true: that is, not every inversion produces a duct. The lapse rate of the inversion must exceed a certain critical value (which is readily calculated) to produce enough bending to trap rays. This critical value is typically about −11°C per hundred meters, for average conditions in moderate latitudes near sea level. That is, the air temperature must increase with height at a rate greater than 0.11° per meter to produce a duct. That doesn't sound like much; and in fact, such inversions occur quite often in the lower atmosphere. Such an inversion is sometimes called “super-refracting”, because the curvature of a horizontal ray in it exceeds the curvature of the Earth. The main difference between ducting at optical and radio wavelengths is due to water vapor's effect on the refractive index of air. In visible light, water vapor hardly changes the refractivity of air at a fixed pressure and temperature. But the radio refractivity is strongly affected by the R(0) line of the pure-rotation spectrum of water vapor, at 1.35 cm wavelength. At longer wavelengths — which includes almost all radio and radar work — the refractivity is considerably increased by even small amounts of water vapor. Consequently, while the optical refractivity of air depends mostly on the temperature profile, the radio refractivity depends mostly on the absolute humidity profile. As the amount of water vapor decreases with height much more rapidly than the density of the atmosphere in general, the radio refractivity gradient is typically about twice as strong as the optical one. So, while the curvature of visible light is typically about 1/6 that of the Earth's surface, the curvature of radar beams is about 1/3 that of the Earth. This means that radio waves need less deviation from average conditions to produce a duct, compared to light. Besides differences in refractivity, and the greater importance of wave-optical effects at radio frequencies, one should be aware of another significant difference between the behavior of radio waves and light: the ocean absorbs most of the light that strikes it; but it reflects radio waves. 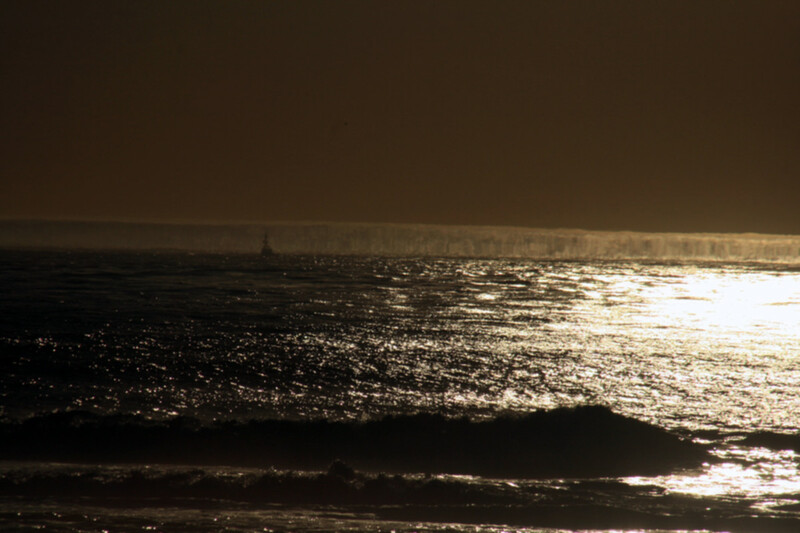 So, while radio waves can travel for thousands of kilometers in a surface-based duct, the analogous optical structure produces a superior mirage of the sea surface only a few kilometers away from the observer. This usually appears as a “false horizon” with negative dip — i.e., what Hasse (1960; 1964) called a Kimmfläche or “horizon surface”. (This is just the upper edge of Wegener's blank strip when the lower one is hidden by the apparent horizon). However, when the low-Sun glitter path is miraged in this way, spectacular images can be produced (like this one by Mila Zinkova). For more detailed discussions of ducting phenomena in sunsets, see the simulations, and the examples of sunset transfer curves. A duct is an atmospheric structure that traps rays within a few minutes of arc of the astronomical horizon, so that they cannot escape from the atmosphere, but are periodically bent back down, so as to follow the curvature of the Earth. The bending is produced by a steep thermal inversion. The inversion can do this if its lapse rate is more negative than a critical value (near −0.11°/m, for typical conditions).